Before the Wine & Spirit Magazine Top 100 Tasting event, I sat down with Pepper Bridge Winery and Amavi Cellars winemaker Jean Francois Pellet to taste and discuss his Washington Wines. JF is one of those winemakers who was born and raised in the industry. He is a third-generation wine grower, having learned the business from his father, who has worked and managed the same vineyard for over 30 years in JF’s native homeland of Switzerland. So, as a young collegiate, it’s no wonder he earned degrees in both enology and viticulture and, as part of those studies, traveled the wine-making world from Switzerland to Germany, and eventually Napa Valley where he worked for the well-known Heitz Cellars for four years. His success in California’s wine country garnered the attention of Pepper Bridge Winery of the Walla Walla Valley in Washington where he ultimately became, and maintains to this day, the chief winemaker. When asked why, after working in wine all over the world, he decided to settle in Walla Walla, Washington, JF had one answer — the land. The AVA’s unique characteristics blend, what JF calls, “the complexity of the old world with the tenacity of the new world.” Indeed, you can taste this collaboration in each of his wines. But when asked if he has a “passion” for the land, the area, the state, JF says no, not really. “There are good wines made all around the world,” he says. “There are bad ones made around the world too,” he laughs. It’s not so much that JF has a passion for Washington, it’s that he’s found a place where he can continuously and successfully grow good winemaking grapes. The vineyards where JF harvests are located in a “warmer” section of Washington (straddling the border into Oregon), where the mountainside slopes in such a way that the fields have a constant exposure to the sun resulting in consistently (and enjoyably) moderate temperatures. The soil in Walla Walla tends to be quite porous, absorbing the rain and nutrients quite efficiently. In fact, these mountainside slopes paired with that soaking soil (and the fact that Washington actually has rain), is the perfect recipe for the 100% certified sustainable farming methods practiced by JF and his peers. “What I have a passion for is good wine,” JF says. So that’s what he’s dedicated himself to, crafting good, wholly sustainable wine that he himself enjoys, but that others can easily enjoy as well. And that’s why JF has taken on two separate wineries, Pepper Bridge and Amavi Cellars — there’s something in JF’s portfolio for every style of wine-drinker. About the Wine: The wine is made from 100% Sauvignon Blanc grapes harvested from the Les Collines and Seven Hills Vineyards in the Walla Walla Valley in Washington. It’s aged in 60% Neutral French oak (emitting little to none of that “oaky” aroma) and 40% in concrete egg — a method, JF explains, helps keep the purity of the grape as well as bring the minerality a bit more to the forefront on the palate. Flavor Profile: Visually, this wine is so pure — the lightest of yellow to the point of almost being clear. Initial aromas definitely say “Sauvignon Blanc,” emitting those classic fruit-forward aromas of passion fruit, guava, pineapple. But on the palate, it’s a different story. There’s a bit of a softness, a roundness to the mouth feel and though softer, stone fruits take center stage, what really spoke to me was the background flavor, which had a bit nuttiness to it — like marcona almonds or even macadamia. The tasting goes from round to soft, from soft to solid, and then comes to a point that forms a lingering line. Can you picture it? That point, that lingering line, that’s the beautiful finish that’s steeped in that watery minerality — like wet, gravely stone, just kissed with fresh river water. Lastly, there’s that acid that just tickles the tongue causing you to salivate just a bit. Just enough to go in for another sip. Food Pairing: I would love to pair this with a soft, but hearty fish like Mahi Mahi along with coconut rice, topped with a tangy mango salsa — a dish that can stand up to the variety of flavors and textures of the wine. 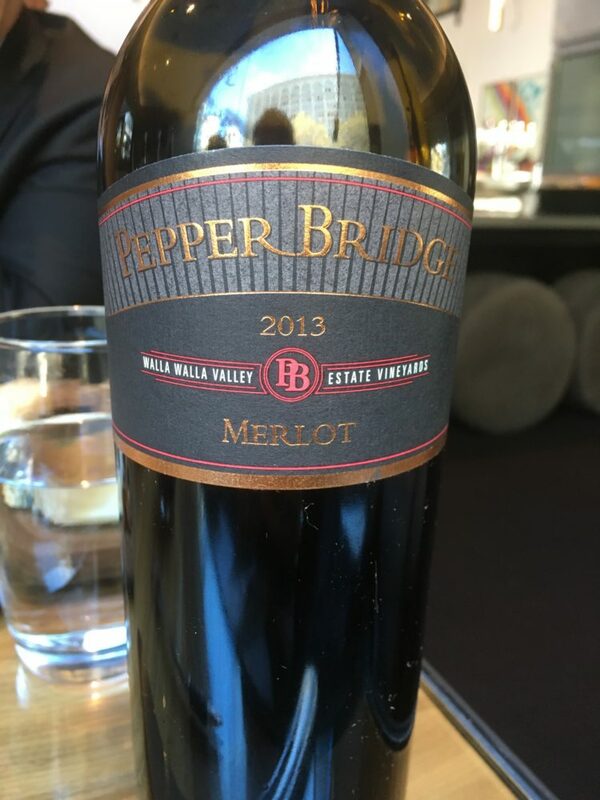 About the Wine: The Pepper Bridge Merlot is a blend consisting of 78% Merlot, 13% Cabernet Franc, and 9% Malbec coming from the Seven Hills, Pepper Bridge, and Octave vineyards in Walla Walla, Washington. The wine was aged in 100% French oak barrels (62% new; 38% neutral) for 17 months. Flavor Profile: This Merlot is a beautiful iridescent red in the glass, emitting a perfume of purple flowers, blue fruits, and a mixture of dark and dried fruits. I never knew a Merlot could be so beautiful– it’s so soft, so delicate, yet simultaneously full-bodied and plush, with just a delicate amount of tannins. And the flavors are just as balanced as the texture with neither fruits nor flowers, neither herbs nor the fertile soil minerality taking center stage, but all of them walking hand-in-hand, painting the perfect picture of a sacred garden. Food Pairing: Pair this with something you love and drink it with someone you love. For me, a simple pan-seared salmon atop wilted greens, accompanied by a cilantro-enfused Jasmine rice, and a drizzle of lemon grass buerre blanc. About Amavi Cellars: The name Amavi Cellars is a combination of the words love (amor) and life (vita). As mentioned, this winery is a bit of a passion project for JF as it is his chance to not only craft the “usual suspects,” (Cab, Syrah) but also a few more unusual or unique offerings, including Semillon, a rosé of Cab Franc, and even a Spanish-inspired Tempranillo. And, true to JF’s nature, this undertaking wasn’t just about himself — what he can or wants to craft — but about sharing more readily available wines to the public. Where Pepper Bridge wines have aging potential, Amavi Cellars’ offerings are ready to drink straight-away. Friendly wines, easy drinkers, with friendly, easy prices to match. About the Wine: Amavi Cellars Sémillon is made from 88% Sémillon and 12% Sauvignon Blanc grapes from the Les Collines, SEven Hills, and Goff vineyards in Walla Walla, Washington. The wine was aged in 100% neutral French oak. Flavor Profile: As a personal note, any chance you have to try a pure Sémillon, just do it. It’s a rare occurance, as it’s usually used as a blending wine to soften the harsher flavors of certain other varietals (like Sauv Blanc). But if and when you find them, they are almost always beautiful. Amavi Cellars is no exception to that rule. 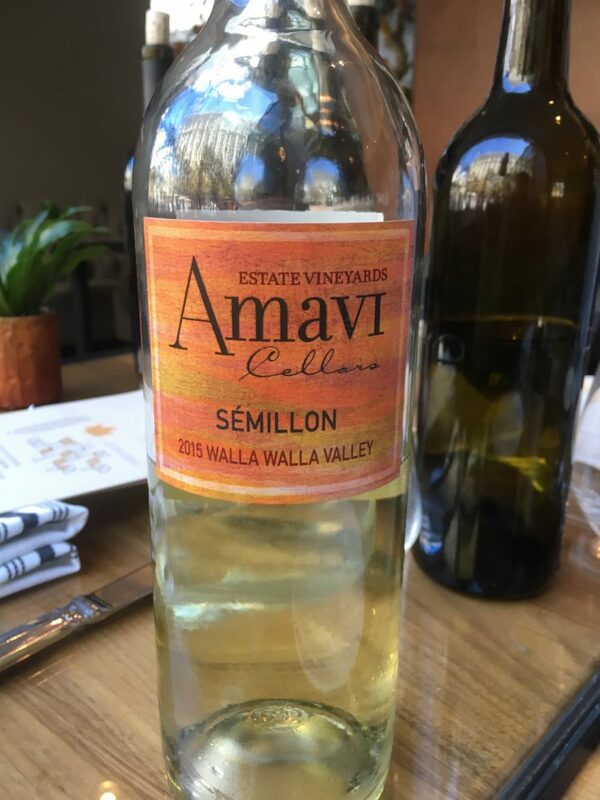 A fun, light yellow in the glass, the initial smell of Amavi Cellars Sémillon is, at first, reminiscent of a Chardonnay, with its lofty apple essence and a hint of melted butter. But it’s so much more once you dive deep into your senses. The wine, on the palate, has a kind of waxy texture, yet its so smooth, as if coating your tongue with cooled candle drippings. The fruit flavors and calm and subtle bringing forth honeydew, cantalope, and maybe just a hint of lime pith. And that hint of lime pith paves the way for quite a tang on the finish as the acid piques the interest of the tongue, alerting the tastebuds, prepping you for your next sip. Food Pairing: I would be as adventurous as the wine with this one. You know how it’s always hard to pair wine with spicy, Asian-inspired dishes? I think this is the wine to try with curry fried prawns, saffron rice, and sautéed veggies galore. 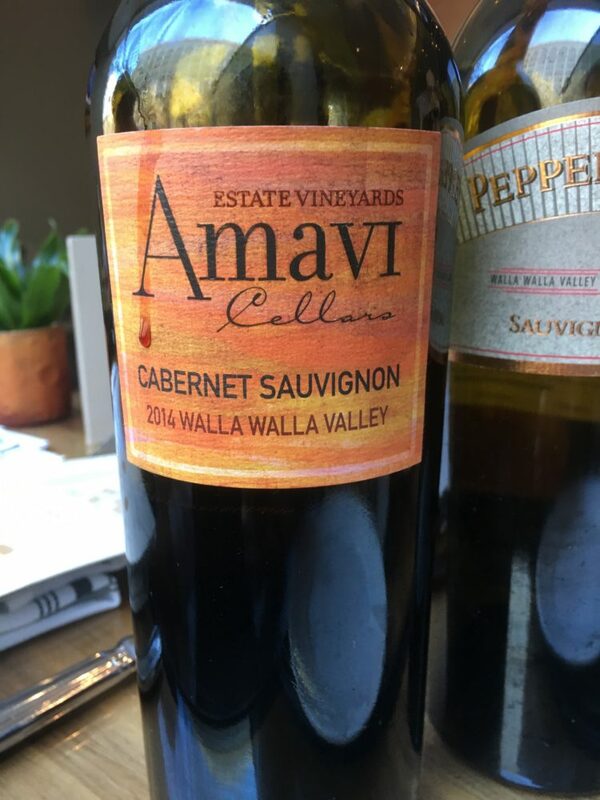 About the Wine: The Amavi Cellars 2014 Cabernet Sauvignon is made from 77% Cabernet Sauvignon, 10% Cabernet Franc, 8% Merlot, and 5% Malbec grapes from the Pepper Bridge, Seven Hills, Summit View, Les Collines, Octave, and Goff vineyards in Walla Walla, Washington. The wine was aged in 96% French and 4% American oak barrels (76% new; 24% neutral). Flavor Profile: Though the wine presents dark, it’s not as sludgy or inky as the Cabs I’ve become accustomed to. The initial aromas are herbaceously earthy, calling to mind the thick greenery of a freshly rained-upon forest. The fruits aromas have a lighter quality, reminiscent of just-ripe cherries dangling from a tree just above a blackberry bush. And its those fruits that ultimately come forward on the palate, while secondary flavors include a bit of smoked or toasted nuts. The texture is rich, full, but completely balanced. The wine is not acidic, but there is acid to be sure (how else could those fruit flavors make such a statement). And there are certainly tannins, yet the wine is not tannic — yielding just enough of those skins to give the wine its body and structure. The truth is these bright flavors, the bit of acid, and the foundational tannins walk hand in hand from start to finish for a full bodied, full balanced Cabernet. Food Pairing: Definitely a steak — with a smokey, peppercorn crust and juicy rare interior. That on its own would pay homage to the tastes and textures of the wine. But personally I’d pair this with an herb-based salad, to pull those initial herbaceous aromas, tossed with fresh blueberries and a crumbling of blue cheese which will call out that damp forest floor feeling. I had never heard of JF, Pepper Bridge, or Amavi Cellars until I was approached by JF’s team at the Wine & Spirit Magazine Top 100 Tasting event. In fact, to be honest, I wasn’t even that familiar with Washington wines other than a few grocery store regulars. But as California’s climate gets warmer and warmer, it does seem that all the cool kids are moving north, and these Washington wines are worth checking out. After tasting this small flight from JF I can tell you this, the terroir of Washington offers balanced wines that truly speak of a fresh fertility of the earth — and a fresh perspective. 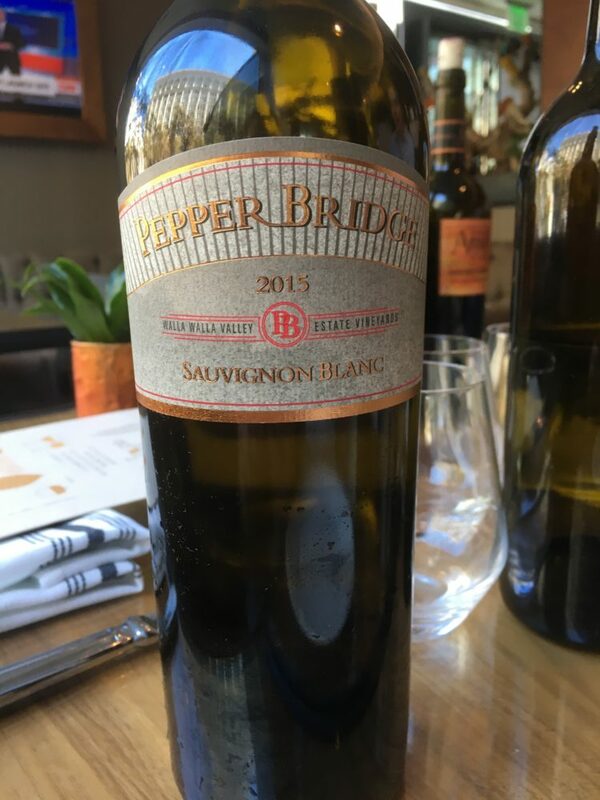 For more specific information about JF and his wineries, please do visit the Pepper Bridge and Amavi Cellars websites where you can read about and order their award-winning wines. Cheers!